I haven’t done one of these in awhile, but as I’ve mentioned in recipe posts, I’m not a “fruit person” and this is especially true when it comes to cooked fruit. However, this recipe (which is from my mother-in-law), is one that I always am ready to dig into, especially now that apples are in season – I make this more often in the fall and winter months. 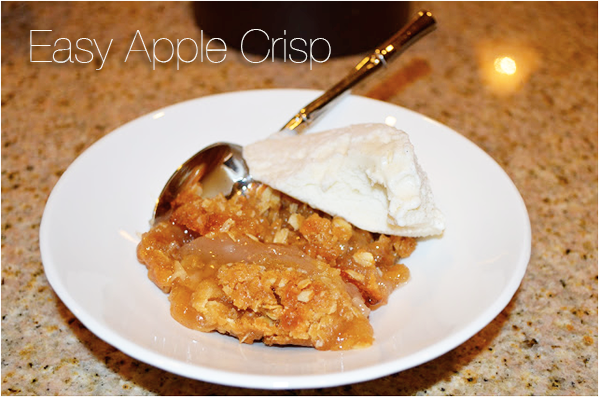 There is a lot of crisp topping, which when mixed with the apples and a good scoop of ice cream, is just perfect. I always have the ingredients for this one in my pantry so I can make it in a pinch if we have people over or need to take something to a friend’s house. It is SUPER easy and so good!